How Shiny Will Christopher Eccleston Be As G.I. Joe's Villain Destro? The first actual image of Christopher Eccleston wearing the famous silvery visage of Destro, from G.I. Joe, has turned up online. How well does he convey the dark-browed one's aura of menace? The Scottish Destro, whose full name is James McCullen Destro, is "the faceless power behind the largest manufacturer of weapons technology," who'll do anything for the right price, according to his file card. Wherever a battle is brewing, you'll find Destro — and if there's no battle, he'll manufacture one, just to further his interests. "The silver battle mask he wears into battle is a family tradition, and one he displays with pride. Makes you wonder what those folks talked about at the holiday dinner table!" (This is all from Destro's "file card.") 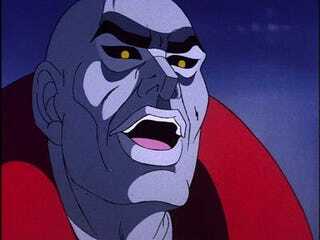 And the only thing stronger than Destro's love of cash is his hatred of the G.I. Joe squad, although he respects their fighting abilities.